Belying hopes of both the government and India Inc., the Reserve Bank of India (RBI), in its second bi-monthly monetary policy review of 2017-18, on Wednesday kept its key lending rate unchanged at 6.25 percent. However, to induce liquidity into the system, the RBI reduced by 50 basis points to 20 percent the Statutory Liquidity Ratio (SLR), which is a reserve requirement that commercial banks have to maintain. The apex bank maintained at 4 percent the cash reserve ratio (CRR), or the quantum of liquid funds which commercial banks have to keep. Announcing the status quo on the key interest rate, RBI Governor Urjit Patel said the abrupt fall in inflation in April "from the firming trajectory that was developing in February and March has raised several issues that have to be factored into the inflation projections. "Risks are evenly balanced, although the spatial and temporal distribution of the monsoon and the government staying the course in effective food management will play a critical role in the evolution of risks." This is the fourth consecutive policy review in which the apex bank has maintained status quo on its repo, or short-term lending rate, since reducing it by 25 basis points to 6.25 percent in October 2016. Consequently, the reverse repo rate, under the liquidity adjustment facility, remains at 6 percent, and the marginal standing facility rate and the bank rate at 6.50 percent. The decision to maintain the repo rate was taken by the six-member monetary policy committee headed by Patel, which voted five-to-one in favour of holding the rate. Since the six-member MPC started setting rates in October last year, this was the first time it did not take a unanimous decision. 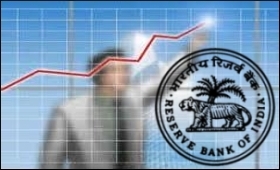 At its last policy review in April, the RBI had kept the key lending rate unchanged but narrowed its policy corridor and hiked the reverse repo rate to six percent. In a press briefing after the announcement of the rates, Patel disclosed that the MPC had turned down the Finance Ministry's invite for a discussion ahead of the panel's policy review meeting. Asked if the ministry invite was an assault on the independence and autonomy of the RBI, he only said the committee did not accept the invite and also did not disclose when the invittion was issued. The RBI also raised concern on the farm loan waivers saying that such actions increase the risk of slippages and contribute to inflation sooner or later. "The risk of fiscal slippages, which, by and large, can entail inflationary spillovers, has risen with the announcements of large farm loan waivers," Patel said. Asked if the effect of demonetisation was evident in the 2016-17 GDP growth of 7.1 percent, Patel said that the data needs to be analysed first before reaching such strong conclusions. Delinking the slowdown in GDP growth in 2016-17 from demonetisation, he said that the deceleration was visible from the very first quarter of the financial year. "The new data released by Central Statistics Office includes new data series of Index of Industrial Production and Wholesale Price Index. In that sense, it presents a much better picture of the economy," Patel said. "That data shows slowdown was there in Q1 well ahead of demonetisation. Agriculture and mining, which are highly cash intensive, were not affected by demonetisation. Rural wage growth remain elevated. Manufacturing, transport, communication has been resilient in second half of 2016-17." He said that the slowdown in GDP was majorly because of deceleration in capital formation. "Slowdown in GDP was majorly due to deceleration in capital formation in Q1, Q2, Q3 and contraction in Q4. It is difficult to segregate these factors." On remonetisation, RBI Deputy Governor B.P. Kanungo said that there was no shortage of cash as 82.6 percent of economy had been remonetised.